There’s an old joke that seems to be always be making the rounds, claiming that there are really only two seasons in Upstate New York—winter and the Fourth of July! Of course, those of us who live here know that there’s nothing further from the truth. The best evidence of that is the Spring-like weather we’ve been enjoying for weeks. And one sign of Spring that I always look forward to is the annual maple run. Last weekend, I visited three local maple producers for the ceremonial first tapping of the season (though, in reality, maple growers have been collecting and boiling sap for several weeks, thanks to the unseasonably warm weather). New York is the third largest producer of maple syrup in the world, and as more farmers start to take advantage of the natural sweetness that lies just at the edge of their fields and pastures we could be in line to be the biggest. Maple sugaring is exactly the kind of value-added activity that can help make a difference to local farmers’ bottom lines. Letting NY farmers farm: I’ve introduced legislation—backed by the NY Farm Bureau and family farmers across New York—that would slash red tape and reduce taxes on all farmers. The best way to help farmers grow is to get bureaucrats out of the way. To start, consider heading out with your family to one of the many local maple producers and farms in the local area. This weekend, from 10 a.m. to 4 p.m., they’re throwing open their doors to share the age-old secrets of maple sugaring that are still being practiced today. You can also find scores of locations where they are serving pancake breakfasts with real maple syrup. 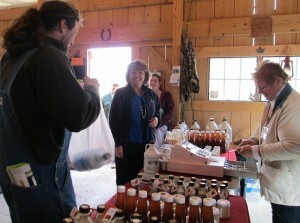 Visit www.mapleweekend.com to find locations in Oswego, Jefferson and St. Lawrence counties. There’s also recipes and a fun coloring book for kids. If you chose to stay at home, think about buying some real New York maple syrup at a farm stand or local grocery. The difference is amazing, and you will be helping to support local agriculture and family farms right in our community.